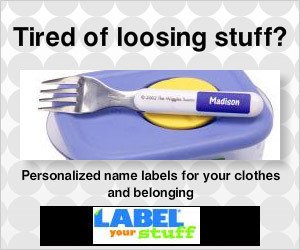 Label Your Stuff creates personalized labels that you can place on clothes, shoes, or other possessions. The selection of labels includes iron on labels for clothes, inner sole labels for shoes and super durable waterproof labels that you can place on diverse goods. Proper labeling of dishes can help sorting things out after big parties. Labels can also simplify travel, when you are traveling with a group where things get mixed up. The company has an affiliate program with Share-A-Sale which is where I got the links for this page.